Biofuels offer renewable alternatives to petroleum-based fuels, which can reduce net greenhouse gas (GHG) emissions dramatically. Even with the expected improvements in electric vehicle technologies, liquid fuels are likely to remain the dominant form of energy used in significant niches within the transportation sector, such as long-haul trucking and air transportation. Today’s vision for cost-competitive domestically produced biofuels are hampered by three key issues: 1) Crops intended for biofuel production may require large tracts of arable land that at scale can compete with the production of food crops; 2) Most biomass is not easily digested and presently requires an expensive or inefficient process to break down dried biomass (i.e. lignocellulose) into its components; and 3) Today’s oil-rich crops do not provide enough of a step up (based on energy yield per unit area) to be a cost-effective alternative for production of transportation fuel at scale. Many plants produce complex chemicals that could be readily transformed into high quality biofuels. For instance, pines have specialized cells that make up resin canals and allow the trees to naturally accumulate moderate levels of terpenes (3-5%) in wood. The terpenes are recovered from harvested trees or from living trees by tapping to extract these fuel precursors throughout the life of the mature tree. However, the natural yield of such chemicals in the plants is too low to allow cost-competitive production of fuels. With improved understanding of developmental and biochemical processes, it is now possible to engineer specific pathways that plants use to create chemicals. This knowledge can be coupled with recent advances of in vitro DNA synthesis, which allow scientists to create a large number of possible gene constructs, and test them rapidly to identify those that increase the plant’s yield of the desired chemical. With ARPA-E support, the University of Florida (UF) has experimented with enhancing fuel production in a species of pine (loblolly) that is currently used in the paper pulping industry. As shown in Figure 1, the team is pursuing a three-part technical approach: 1) Activation: increasing resin synthesis and storage capacity in wood by modulating developmental regulators of resin canals; 2) Pathway: improving flux through the terpene biosynthetic pathway by alleviating bottlenecks in the metabolic pathway; and 3) Enzyme: developing more active terpene biosynthesis enzymes and channeling of substrates more efficiently through protein engineering to specific terpene molecules with desired fuel properties. These three approaches are intended to come together during the project, with traits from each approach being stacked into a single pine tree to meet the final program goal. In total, under ARPA-E project support, UF, ArborGen and the University of California, Berkeley’s Joint BioEnergy Institute (JBEI) have generated 10,000 transgenic loblolly pines using genes identified through these three strategies. For strategy 1, UF investigated the process by which stimulating the tree with treatments of methyl jasmonate increases the amount of turpentine in harvested pine and identified the genetic controls behind high terpene accumulation. UF analyzed the global gene responses in pine to chemical stimulation and used association genetics to select the most promising gene candidates to test in transgenic trees. In parallel for strategy 2, JBEI discovered a novel metabolic pathway from C5 sugars to terpenes in bacteria. This pathway is more direct and energy efficient than the current terpene biosynthesis pathway and also circumvents feedback regulatory mechanisms. UF/ArborGen transformed the key gene and observed that the bacterial gene functioned in pine. Young (18-month) transgenic pine trees expressing the bacterial gene accumulated significantly more terpenes than wild type pines. Pine trees naturally produce a mix of terpene molecules. As part of strategy 3, JBEI identified genes from other plants that produced enzymes that preferentially synthesize terpene molecules with properties desirable for fuel uses, such as a-pinene. JBEI utilized various protein engineering strategies to improve the specificity and rate of activity of terpene synthase enzymes in vitro, and these gene candidates have been transformed into pine trees. In total, UF and JBEI built 137 gene constructs, made up of individual or combinations of genes identified by the three strategies. These constructs include gene combinations from each strategy predicted to act most synergistically to produce and accumulate terpenes. The oldest of the transgenic trees developed under this project are now three years old, and so far the most promising lines show roughly a doubling of wood terpene concentration at the sapling stage. To allow processing of 10,000 trees in a timely manner, NREL developed high throughput analytical techniques based on gas chromatography and pyrolysis molecular beam mass spectrometry to rapidly quantify terpenes in wood samples. While not all the transgenic trees have been characterized yet as they continue to grow, the project’s model for terpene accumulation suggests that the most promising lines so far could yield 12% terpene once those trees have fully matured. 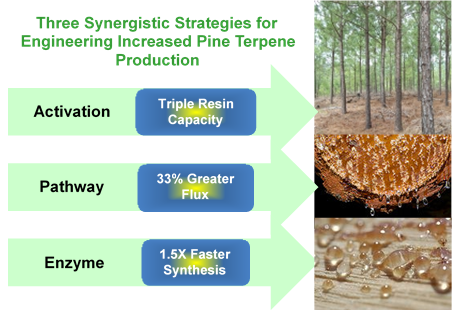 In parallel with developing the transgenic pines, UF has also continued to work on chemical stimulation as a route to increase terpene content in the near term with an industrial partner, Ingevity Corporation. Ingevity supplies pine-based chemicals used in the manufacture of products for the asphalt paving, oil exploration and production, agrochemicals, adhesives, lubricants, and printing inks industries. At the end of this project, UF will have produced transgenic pine saplings up to four years old and quantified the improved production of terpenes. The team will also have completed a techno-economic assessment (TEA) of the commercial potential for an alternative approach of treating trees chemically, just prior to harvesting, to increase the yield of terpenes. Because the market for biofuels has been affected by low oil prices and regulatory uncertainty, the first markets are expected to be in specialty chemicals. The newly developed methods of chemical stimulation and mechanical tapping of existing stands of southern pines show promise for a first market entry with these chemicals. The TEA indicates that this technology would create $1500/acre of gross economic activity and $150/acre of annual net income for land owners while the trees are growing. This ongoing income stream and terpene production would provide economic optionality to these owners that is uncorrelated with the housing lumber market, while simulataneously maintaining sufficient terpene supply for the speciality chemicals market. The UF project has demonstrated the practical potential for identifying pathways and using transgenic approaches to increase desired chemical production from plants, as the pathway identified by JBEI would be expected to increase levels of terpenes in most plants. The longer term commercial objectives of the engineered trees are: to triple terpene feedstock per tree; to address supply concerns for the manufacture of the aforementioned specialty chemicals in the United States; to increase the value of this agricultural product for land owners and pulp and paper mills; and to provide increased employment and economic development in rural areas of the southern United States. Ultimately, such approaches could make domestic crops the source of fuel precursors for the domestic production of aviation and diesel biofuels, enabling large-scale production of replacements for petroleum-based fuels. A concrete example based on the TEA would be the development of a new renewable fuel source from pines at a cost of <$50/BOE, yielding 100 million gallons of fuel on an area (10,000 hectares)smaller than Washington, DC. Kirby, J. et al. (2014).Use of nonionic surfactants for improvement of terpene production in Saccaromyces cerevisiae. Applied and Environmental Microbiology. 80: 6685-93. Kirby, J. et al. (2015).Enhancing Terpene Yield from Sugars via Novel Routes to 1-Deoxy-D-Xylulose 5-Phosphate Appl. Environ. Microbiol. 81: 130-138. Suseata, A., Peter, G.F., Hodges, A.W., Carter, D.R., 2014. Oleoresin tapping of planted slash pine (Pinus elliottii Engelm. var. elliottii) adds value and management flexibility to landowners in the southern United States. Biomass and Bioenergy 68: 55-61. Westbrook, J. et al. (2014).Discovering candidate genes that regulate resin canal number in Pinus taeda stems by integrating genetic analysis across environments, ages, and populations. New Phytologist. 199: 89-100. Westbrook, J.W., Walker, A.R., Neves, L.G., Munoz, P., Resende Jr., M.F.R., Neale, D.B., Wegrzyn, J.L., Huber, D.A., Kirst, M., Davis, J.M., Peter, G.F., 2015. Discovering candidate genes that regulate resin canal number in Pinus stems by integrating association genetics and QTL analysis across environments, ages, and populations. New Phytologist 205: 627-641.